Does music excite you? Have you imagined yourself ever playing the violin, a sitar or a piano? If you have a passion for making, then this challenge would excite you. 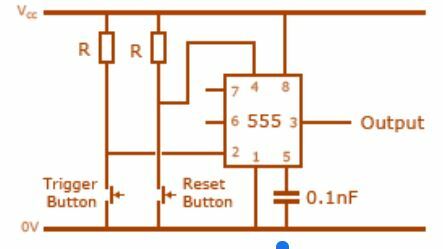 We’re asking you to make a piano using 555 Timer IC. Interested? Let’s discover how you can go about making one and unleash that inner Mozart of yours! 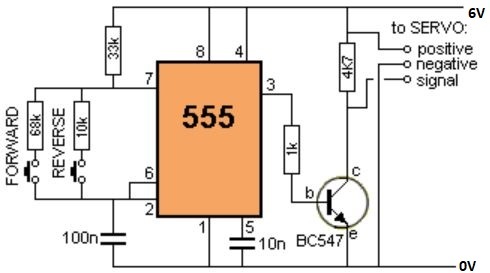 How does IC 555 work? You may wonder what’s inside the 555 timer chip which makes it work. 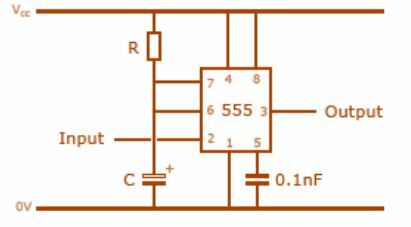 555 timer chip is an Integrated Circuit (IC) that contains a small circuit surrounded by silicon. Each of the pins is connected to the circuit which consists of over 20 transistors, 2 diodes, and 15 resistors. ed to find out the time out a delay of a trigger input. 2 TRIG The OUT pin goes high. In other words, OUT is high as long as the trigger is low. 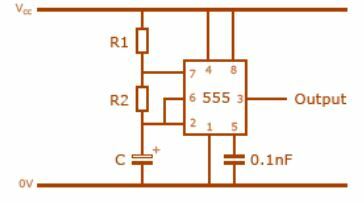 The output of the timer totally depends upon the amplitude of the external trigger voltage applied to this pin. 3 OUT This output is driven to approximately 1.7 V below +Vcc, or to GND. 4 RESET A timing interval may be reset by driving this input to GND, but the timing does not begin again until RESET rises above approximately 0.7 volts. Overrides TRIG which overrides threshold. 5 CTRL Provides “control” access to the internal voltage divider. 6 THR The timing (OUT high) interval ends when the voltage at threshold is greater than that at CTRL. 7 DIS Open collector output which may discharge a capacitor between intervals. In phase with the output. 8 VCC Positive supply voltage, which is usually between 3 and 15 V depending on the variation. The 555 has three main operating modes: Monostable, Astable, and Bistable. Each mode represents a different type of circuit that has a particular output. An Astable circuit has no stable state. The output continually switches state between high and low without any interference from the user, called a ‘square’ wave. This type of circuit could be used to switch the motor on and off at regular intervals. It can also be used to flash lamps and LEDs and used as a ‘clock’ pulse for other digital ICs and circuits. A Monostable Circuit produces one pulse of a set length in response to a trigger input such as a push button. 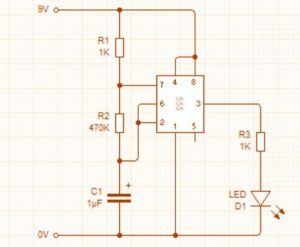 The output of the circuit stays in the low state until there is a trigger input. 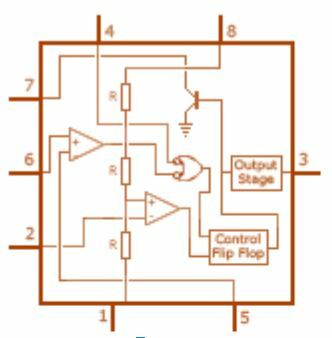 This type of circuit is ideal for use in a “push to operate” system. A visitor can push a button to start a model’s mechanism and set it in motion he mechanism will automatically switch off after a set period of time. A Bistable Mode has two stable states, high and low, controlled directly by trigger pin and reset pin using push buttons for both. 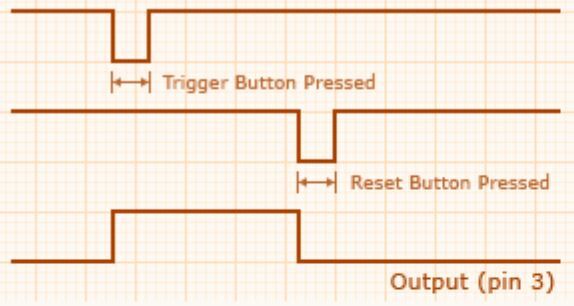 If trigger pin is pressed, the circuit will go in high state and will remain in this state until the reset pin is pressed, which will make the circuit revert to low state. 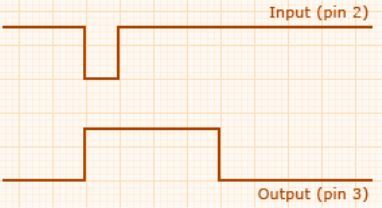 In an astable circuit, the output continually switches state between high and low. The duration of the high and low states are based on what values you choose for R1, R2, and C1. Similarly, in the monostable circuit, we need to find out the time out a delay of a trigger input. Now tinker and start making your own piano. Are you finding it difficult to #make an #ElectronicPiano? 2. Connect 2 alligator clips to 9V (one on each pole). 3. Connect negative clip to LED(-). 4. Connect LED(+) to one end of the potentiometer and alligator terminal negative pole on another end of the potentiometer. Now the Intensity of LED light will be changed according to potentiometer value.